If you’re in the market for cheap linen tablecloths, you’ve come to the right place. 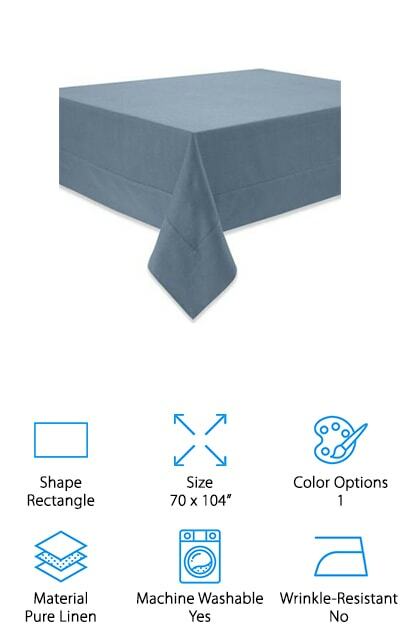 We know how much a linen tablecloth can bring to a table, be it for a fancy dinner or an informal gathering. That’s why we found a wide range of choices when we were doing our research for this linen tablecloth buying guide. Before we get started, let’s take a closer look at some of the features you need to consider when shopping. Shape: Generally, the shape of the tablecloth should match the shape of your table, especially if you’re going for a more formal look. Don’t worry, we found various options, including squares, rectangles, and a beautiful circular option. Size: Size should match your table to a degree, too. Some overhang is ideal, though. Most people recommend an overhand of about 6 to 12 inches. That said, we think there’s really something striking about one that goes to the floor. Color Options: While you do have some options when it comes to color, most of them are more natural colors. Even the purple and blue ones look pretty natural but, hey, it’s a linen tablecloth. It’s supposed to look that way. Material: All but one of these tablecloths are 100% pure linen. They come from various places but they’re all pretty pure. The one exception is the linen/cotton blend tablecloth that we found. It really gives you the best of both worlds. Machine Washable: You kind of need your tablecloth to be machine washable if people are going to be eating on it. All of these are, though special care must be taken, so follow the directions that come with your tablecloth. Wrinkle-Resistant: Linen is a bit notorious for wrinkling and these tablecloths are no exception. Luckily, the can all tolerate an iron on a low setting. The one exception is the linen/cotton blend which is wrinkle resistant. Now that you know what to look for when trying to find the perfect linen tablecloth, let’s get into our reviews. If you’re in a hurry, look at our top and budget picks first. They’re right at the top of the list. Stick around if you can. You might be thinking that there’s not much variety to be found when it comes to linen tablecloths. Well, you’re in for a surprise. Are you ready? Let’s get right to it. 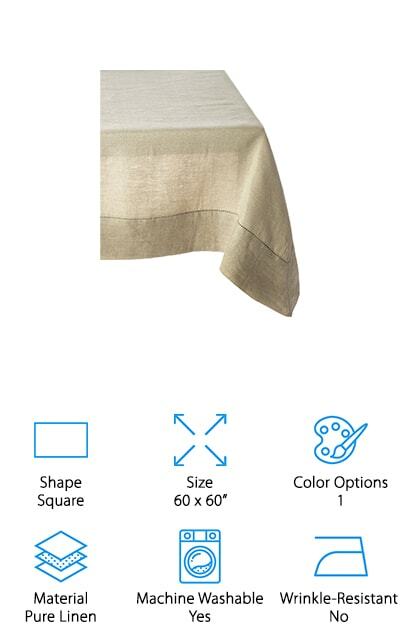 One of the best linen tablecloths for sale is the Solino Home Tablecloth. It’s made of pure linen, 100% European flax and handcrafted. We really like the color options with this product. You can choose from natural linen, grey, brown, navy, and purple. All of the options are deep and saturated while still looking perfectly natural. 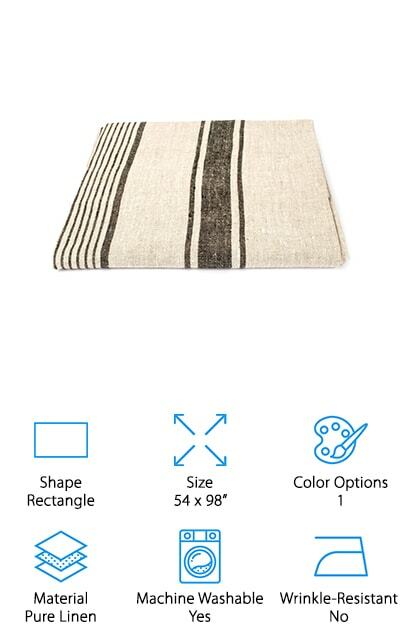 The rectangular 54 x 72 inch size is perfect for a standard sized kitchen or dining room table and the brand even offers coordinating products that will make your table the envy of all dinner parties. It’s important that a tablecloth be easy to take care of since there’s a pretty good chance it will get soiled during a meal. All you have to do it toss it in the washing machine with cold water and a mild detergent. There’s no such thing as cheap linen table cloths because, no matter what you pay for it, linen just always looks classy and polished. But, if you’re looking for a bargain, you can’t do much better than our budget pick, this tablecloth from Orient Originals. It’s a 60 x 60 inch square made of 100% pure linen, perfect for both a casual party or a formal sit down dinner. You can even throw it in the washing machine when you’re done. One of the reasons that we were drawn to this design is the hemstitch detailing. It adds a bit of polish and is a really nice detail. This one is available in a few colors: natural, charcoal, indigo, and ivory. Each one is a little muted so they keep the look of genuine linen. Next up is the Loom State Tablecloth and it’s one of the best picks for anyone looking for a tablecloth for 7 foot tables. It’s big - 60 x 120” total - so it really gives you a nice amount of coverage. This 100% pure linen product is machine washable and can be ironed on a low heat setting to get out any wrinkles from the wash. We love the hemstitch border, it adds some visual interest without being distracting. This one is only available in white and we really love the way it looks. It reminds us of something you’d find in a fine dining restaurant because it’s so crisp and fresh looking. Matching linen napkins are also available so you can create a gorgeous table for your next dinner party or big holiday meal. 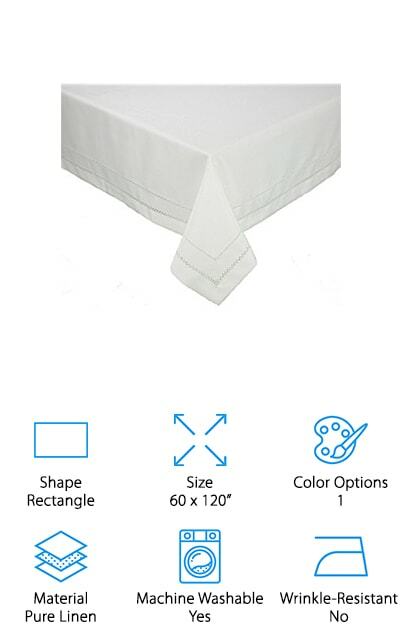 If you love the look of linen but don’t want to cover your whole table with it, this Organic Linen Tablecloth Topper is perfect for you. 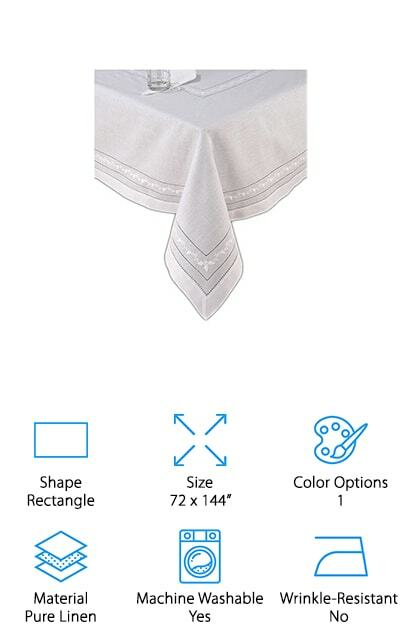 The 35 x 25 inch linen tablecloth topper is made in Ukraine from 100% linen. We were blown away by the details of the designs. There are 8 to choose from. Each has a solid linen background of white, grey, or beige linen. It’s the fine details of this topper that make it such a beautiful piece. The designs range from grey ivies and leaves of the Grace, Harmony, and Symphony design to more intricate floral embroidery. Choose from green ivy, red poppies or roses, even bright yellow sunflowers. These pieces are really unique and simply lovely, you won’t want to put them away when the meal is over. The LinenMe Provence Tablecloth is made from 100% European linen. It’s a decent size at 54 x 98 inches. While most of the tablecloths we’ve reviewed so far have been solid colors, this one makes a bit more of a statement with the addition of a series of stripes. Thin dark brown stripes run down the center of the table against the natural colored background. They’re accented on either side with larger brown stripes which are then repeated near the edge. While it’s all done in natural colors, the stripes are bold against the light background and it will really add a lot of charm to your dining room table. 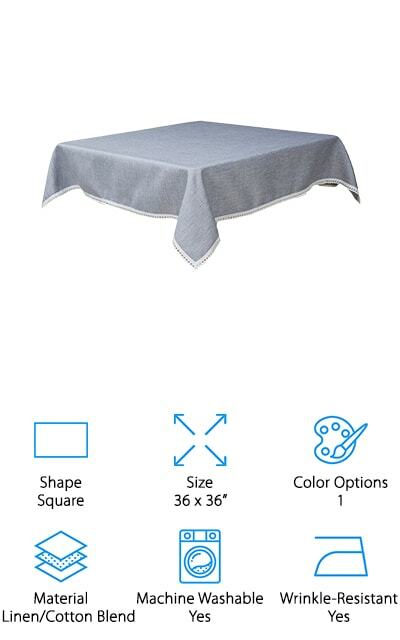 This tablecloth is machine washable and not as light and airy as the other items we reviewed. It has some substance to it and should hold up well. 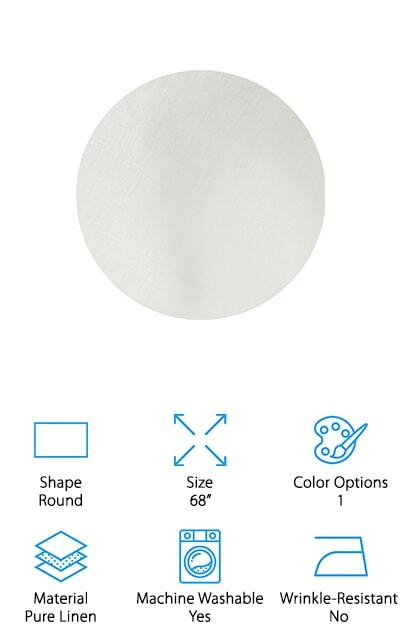 When it comes to round tablecloths for sale, this one from Huddleston Linens is one of the best around. 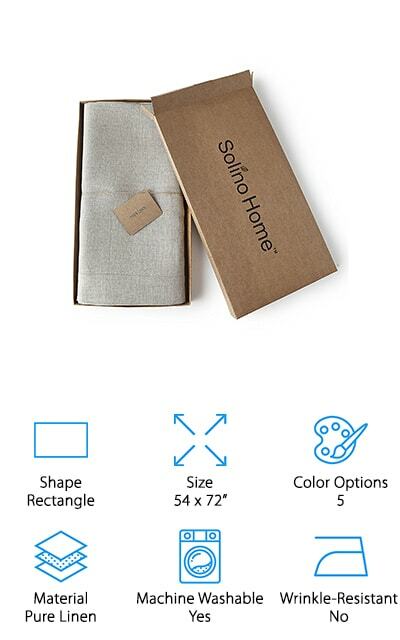 Because it’s made of 100% pure Italian linen, it’s very durable and resistant. It can tolerate years of going through the washing machine and won’t pill, break, or lose its shape. If you happen to get a stain that won’t come out easily in the wash, you can even soak the area in a stain remover like OxiClean without worrying about the fabric yellowing or otherwise discoloring. This item is 68 inches in diameter and the recommend a drop of 6 to 12 inches around the table. The pure ivory color is a beautiful backdrop to any table setting. It looks classic and elegant. It’s really something every hostess should have for formal entertaining and makes a great gift. Next up in our linen tablecloth reviews is this stunning piece from Waterford, the Addison Tablecloth. It’s made of pure linen and is solid white. This one is pretty large at 70 x 104 inches. It would make a great addition to any family holiday spread or formal dinner party. The hemstitch detailing adds just the right amount of visual interest while maintaining its classic elegance. While this product is machine washable, it is not wrinkle resistant and may need to be ironed on a low setting after washing. Because it’s a neutral shade, it will match any decor and go with any tableware or color scheme. Waterford is a brand that’s well-known for their elegance, and this delicate tablecloth is no exception. It adds class and sophistication to any dining experience. The BT Fine Linen Tablecloth is large, 72 x 144 inches. It’s made of 100% pure linen and only available in crisp white. There are a lot of reasons why we chose this one for our reviews. It’s high quality, elegant, sophisticated. But mostly we just really liked the fine stitched accents. It uses 3 different types of stitches: a hemstitch, Madeira, and Gilucci. The result is an elegant border that adds a lot of detail. This design is repeated around the center so it lays right down the middle of your table. Since all the stitches are done using white thread, the design doesn’t distract from the natural beauty of the piece at all. Here’s another thing we love. Not only do you get this beautiful tablecloth. It also comes with a set of 12 napkins. Sur La Table has a gorgeous linen option that could be considered cheap tablecloths for sale if only it weren’t so well-made. It’s woven from pure Belgian linen and is a nice, soft tablecloth to add to your table. Each one is pre-shrunk and washed to give is a smooth, feather-soft texture and a relaxed drape. Its available in 2 sizes but only comes in a pure, natural linen color. It’s machine washable and can tolerate a cool iron setting to work out any wrinkles that come from washing. Sur La Table is famous for their kitchen and dining excellence and expertise. They offer a lot of coordinating products, too, so you can really take your table up a notch for your next dinner party or holiday meal. The last item on our list is from Manven and has one unique characteristic that we haven’t seen yet. 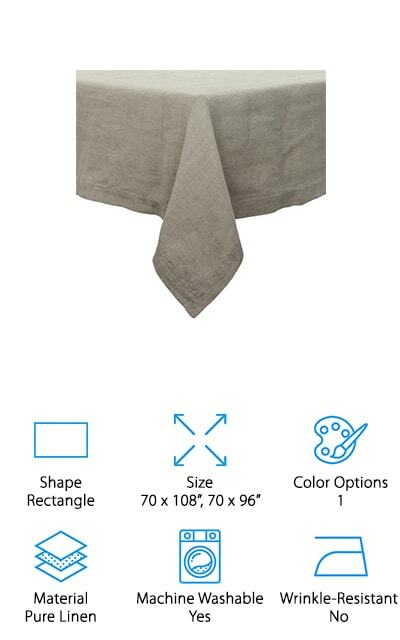 This isn’t 100% pure linen like all the other products in our reviews. It’s actually a 90/10 linen/cotton blend. What does that mean? You get the look of real linen with the advantages of cotton. You can spot clean it with a damp cloth or toss it in the washing machine. This is the only tablecloth we reviewed that can be tossed in the dryer on a low setting. Plus, you can even use a steam iron on it to get the wrinkles out when it’s dry. 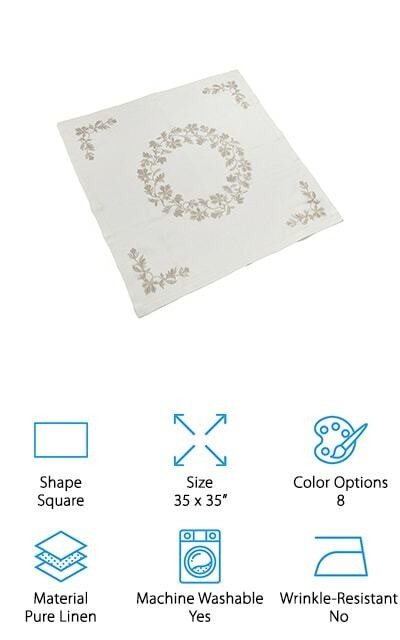 This 36 x 36 inch square tablecloth can be used with small square or round tables or you can even use it as a table topper on a larger table.